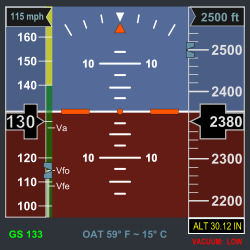 Using AeroData in your EFIS. A growing number of glass cockpit / EFIS manufacturers wants to offer their customers an alternative for the existing aeronautical databases that are available. They have found that the PocketFMS AeroData is an excellent choice, mostly because of the richness and detail offered and the "can do" mentality of the PocketFMS team. There's now a growing group of manufacturers that can accept our AeroData on their systems. More background details on our AeroData are found here. NOTE 1: A Dataset is typically updated every 28 days, conforming with the international AIRAC cycle. However, if major changes have occurred in between cycles, intermediate updates are made available. Glider Pilot Shop (GPS) AeroDatasets are refreshed multiple times a day, because they contain NOTAMs as well. NOTE 2: A Dataset contains airspaces, airports, runways, remarks, frequencies, IFR reporting points, VFR waypoints, NavAids and obstacles. It does NOT contain maps depicting roads, rivers and cities! NOTE 3: A GPS AeroDataset contains a selection of airspaces that are glider-relevant, as well as a selection of NOTAMs that are glider-relevant. Because of these NOTAMs, this Dataset is refreshed multiple times a day. Here's a list of 3rd party manufacturers in no particular order that have one or more devices that can use a PocketFMS Dataset. Click on the respective logo for more details & purchase options. StratoMaster, Odyssey, iEFIS. - Download from Members Only. - Export plates via EasyVFR for macOS / Windows. SkyView D700, D1000, HDX800, HDX1100. - Download from Members Only. (FFM or Dynon Dataset licence required). LX8000, LX8080, LX9000, LX9050, LX9070, eCopilot 7 and eCopilot 10. Oudie / SeeYou Mobile. More to follow! - Download from Members Only. (FFM or GPS AeroDataset licence required). G-Touch Head-Up Display. - Export via PocketFMS Desktop. Multi-function Display (MFD) - Via Becker Avionics. AF-3400s, AF-3500s, AF-4500s and all AF-5000. - Export via PocketFMS Desktop. Updated on 6FEB2019. Trademarks & copyrights are property of their respective owners.